You've found the “U.S. 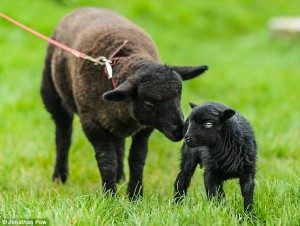 Ouessant Sheep Breeders” page here at Hobby Farm Wisdom! If this is the first time you have visited our site: Welcome! Originally from Ouessant, France, the Ouessant’s are one of the smallest breeds of domestic sheep. They are the result of selective breeding of European short-tailed stock. Mature Ouessant rams stand only 19 inches tall at the shoulder, with ewes only 18 inches tall. Their small size is due in part to the meager grazing available on their native island. Ouessant sheep are most often black and brown with white seen only rarely. Despite their small size, rams of this breed have horns that can be impressively large. Ouessant sheep produce a thick fleece that historically was the primary material used for clothing on the island. Small farmers enjoy raising this breed of sheep because it is easy to hand, and require less space than other breeds.